Nytt från den Finlänska urmakaren Antti Rönnkö, Gold Calender Edition. Handmade timepiece based on the ancient myth of Daedalus. 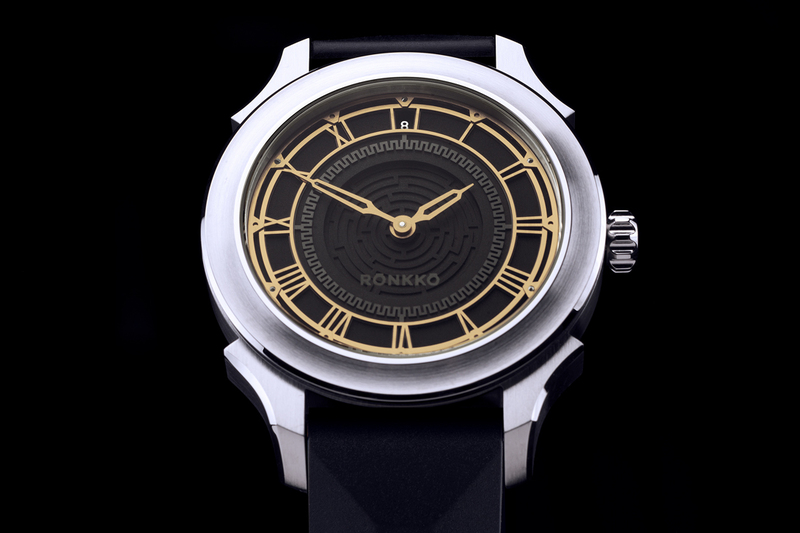 The Rönkkö Daedalus Calendar Edition incorporates a customised Swiss Soprod A10 movement, which displays the date at 12 o´clock – with a moving labyrinthine dial rotating anti-clockwise day-by-day. 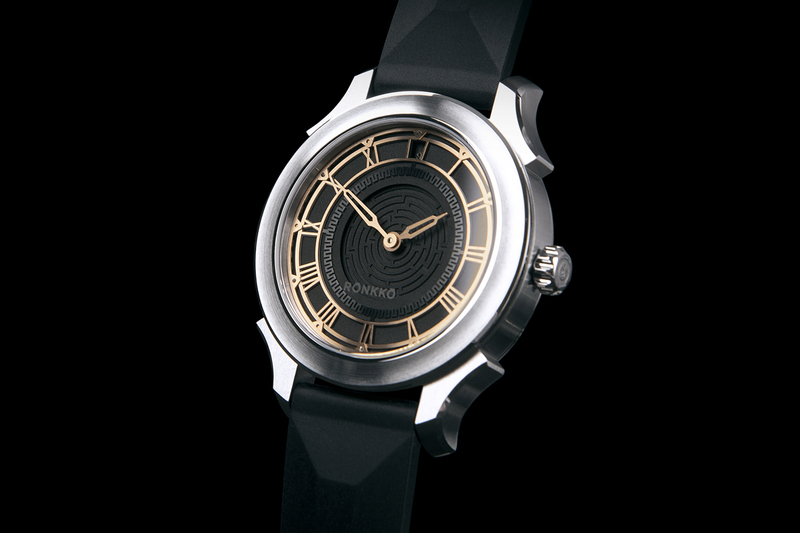 The masterpiece of Daedalus, the labyrinth, is in the middle of the matt black-coated dial made of interlaid parts. Finding your way in this fast-moving world is sometimes like being in a labyrinth: it’s not whether you’ve lost your way, it’s whether you can get back on the right track again. The case of the Daedalus timepiece is made of 316 L stainless steel with hand finished matt- and mirror polish bevels. The profile of the bezel and dial ornament, the Greek key, reminds us about the ancient architecture of the Greco-Roman era. The ornament is believed to be the simplified symbol of the labyrinth: some say it’s a sign of eternity or of the never-ending cycle of time. 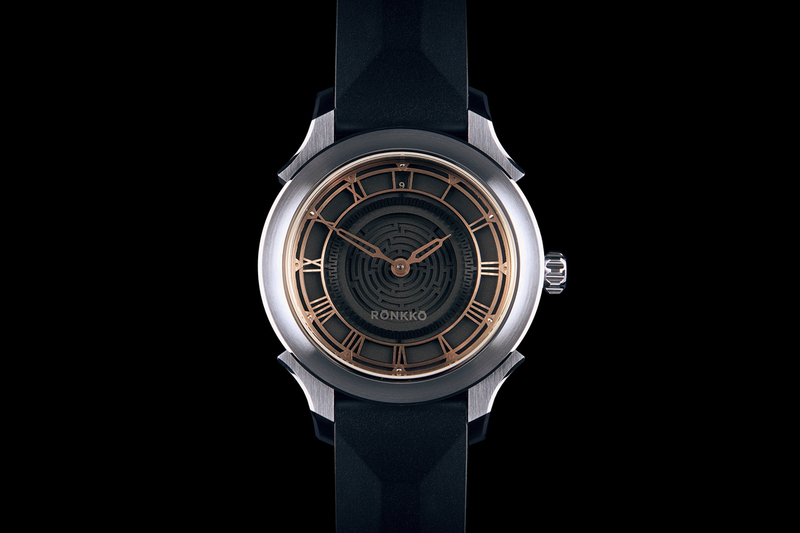 The dial of the Daedalus timepiece is a combination of two colors: the skeletonised hands and index are rose gold color; by contrast, the layered dial is black matt with a circular black meandering ornament. The skeletonised index displays hours in roman numerals and shows the date at 12 o´clock. The case back of the Daedalus timepiece reminds us how creativity can solve problems of any size: when held captive on Crete, Daedalus escaped with his son Icarus by building a pair of wings to fly away. Only 10 timepieces are being crafted. 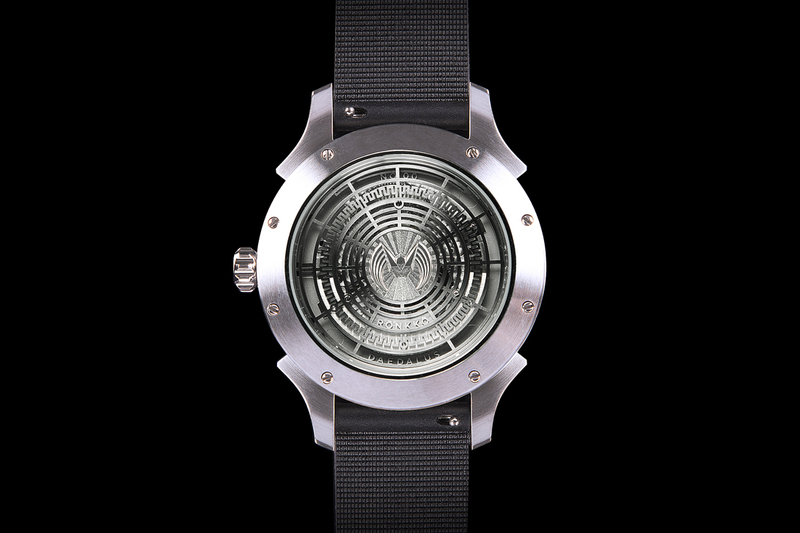 Each comes with a flying Icarus talisman in free rotation at the middle of the labyrinthine rotor in an open case back coated with clear sapphire glass. The Icarus talisman itself measures 10,5 mm and is crafted with 180 facets as an interpretation of the winged flying Icarus. high definition. This silent signature of the maker is only visible from certain angles.The timepiece comes with a matt black natural rubber strap but also can be ordered with a handmade strap of genuine alligator leather. Each of the 10 exclusive handmade pieces of the Daedalus Calendar Edition retails for 10 540 euros, excluding VAT. • Day-by-day rotating labyrith in the middle of the dial. In Greek mythology, Daedalus was a brilliant inventor, architect, craftsman, and artist. He is credited with creating the great labyrinth for King Minos of Crete to hold the Minotaur,and with inventing carpentry, the saw, the axe, the plumb-line, and the drill, as well as glue and isinglass. He first conceived of masts and sails for the ships of King Minos´ navy. He is also said to have carved statues so realistic that they looked alive and seemed to move. The legacy of Daedalus suggests that ingenious creativity depends on the ability to capitalize on the multiple modalities of the human mind and body, allowing them to freely converse with one another. It reminds us that the physical and the psychic are intertwined and must jointly participate in the process of creation. Sometimes the road to unique insight passes close to the madness, yet still ingenious creativity always is the highest form of intelligence. Great master Daedalus undoubtedly knew this.